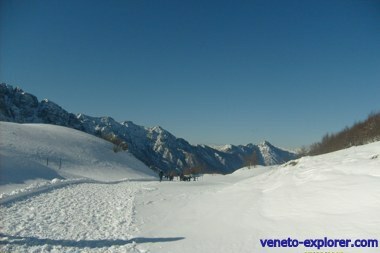 Want to organize your holiday in Veneto? Beyond cities of art like Venice, Verona, small medieval towns and renaissance villas you might want to explore the natural beauty of the region. Here below I’ll outline a list of worth-seeing Veneto spots uniquely from a natural point of view. As you can see, the Veneto’s landscape features a great diversity: geologists use to depicts it as a synthesis of Europe, as you can range from the Mediterranean climate peculiar to the lake of Garda and the Adriatic coast up to the Dolomites mountains, towering over 3000mt/8400ft above sea level. As the crow flies the Dolomites and the Veneto coast are only 100Km/62ml apart, but from a geological and climatic point of view they are equivalent to 3000Km/1870ml of European latitude. The Dolomites are nothing more than the south-eastern part of the Alps, crowning the northern border of Veneto. Even though they are part of the Alpine chain, you can easily tell the Dolomites apart from the rest of the Alps: in fact they are characterized by a pinkish color, especially at sunset (typical of the dolomite stone which they are composed of), by cliff faces and impressive pinnacles. with its majestic and pinky peaks like Tofane and Tre Cime di Lavaredo. The small village of Cortina d’Ampezzo, thanks to the stunning beauty of the surrounding mountains, has been for decades kind of an Italian Aspen, having hosted over the years a lot of jet-set on vacation, and having been the set of movies starring actors of the likes of Elizabeth Taylor, Roger Moore, Sylvester Stallone (Cliffhanger), Frank Sinatra, Peter Seller (The Pink Panther) and others. Located north of the province of Vicenza rise the Piccole Dolomiti (Little Dolomites). Both hikers and history passionates consider them a paradise, having been the location of bloody battles between Austrians and Italians during the 1st World War. The legacy left is a thick network of trails built by soldiers. A trail that you absolutely cannot miss if you like mountain hiking is the unique Sentiero delle Gallerie or 52 galeries trail on the mount Pasubio. There is anything like that in the world. It’s about a very scenic track with 52 tunnels dug into rock by the Italian soldiers during the first World War, and considered an out-and-out engineering masterpiece. Don’t forget to bring a torch. To the nature lovers, another interesting area is the pre-alpine belt: expanse of rolling hills overlooking the plain (they can even reach an altitude of 2000 metres above sea level at the pinnacle). The following hills are ideal for a getaway under the sign of nature, hiking, bycicling, horseback riding and wine and food tasting. They are located south of Vicenza and they reach 445mt/1460ft of altitude at the pinnacle. Those bunch of green cone-shaped hills (about 600mt/1970ft at the pinnacle) rise straight from the plain, as though a child had painted them. Located south-west of Padua they belong to a 18,000ha/44,480acres national park set up by the Region Veneto in 1989. Beside a lush natural setting rich in thermal springs (and Spas) in the Colli Euganei area you’ll have the opportunity to visit ancient villas and timeless medieval village like the romantic and timeless Arquà Petrarca or the nearby Monselice with its 1200's castle, then interesting monasteries like the medieval Praglia Abbey . they all boast great richness in natural and cultural attractions, and are dotted with typical country-houses and renaissance villas, embellished by forests (Montello) and vineyards. The renowned sparkling Prosecco wine is made just in the Valdobbiadene and Conegliano hills. green and rolling hills not far from Verona. It is a wine producing area famous for the red Amarone wine , one of the most prestigious Italian wines. A place for those planning a tasting wine getaway, driving along one of the picturesque wine routes. A land of quaint hamlets and old villas: it is not by accident that the Hollywood celebrities Angelina Jolie and Brad Pitt have recently bought an ancient villa in the Valpolicella countryside. it is the biggest Italian lake, surrounded by picturesque small villages embellished with medieval castles and walls. The climate of the lake is very mild even in winter, thus it is surrounded by a Mediterranean flora made up of palms, bouganvilleas, oleanders, lemon trees, cypresses and olive trees (it is an important olive oil producing area as well). an endless strip of fine golden sand, ideal for spending with children a relaxing holiday in Veneto. This part of the Mediterranean does not boast the clearest water of all though: do not forget that into the Northern Adriatic flow several big Italian rivers like Po, Brenta, Adige. Over the millenniums they have been carrying debris, creating a broad sandy seabed and quite cloudy water. The Delta of the river Po, on the southern Veneto’s coast, is a paradise for birdwatchers. Do not miss it if you like this kind of leisure, as this is one of the biggest Deltas of Europe.